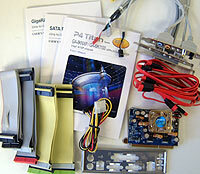 Abstract: We're testing Gigabyte's GA-8KNXP. The GA-8KNXP is based on the i875P chipset and the board has native support for Serial ATA/Serial ATA RAID, Ultra/133 RAID, IEEE 1394, GbE LAN, and 5.1 audio. Aside from Microsoft, Intel is the only other company that can dictate market trends and the direction and pace at which the industry moves. When Intel first released the Pentium 4 processor two years ago, it said right from the beginning that the processor had to ramp up to high speeds before its true potential could be realized. Impatient as we all were, most of the hardware community screamed murder at the fact that a Pentium III 1GHz CPU could perform as fast as the flagship Pentium 4 1.5GHz processor. Fast forward a year or so and things have changed quite a bit. 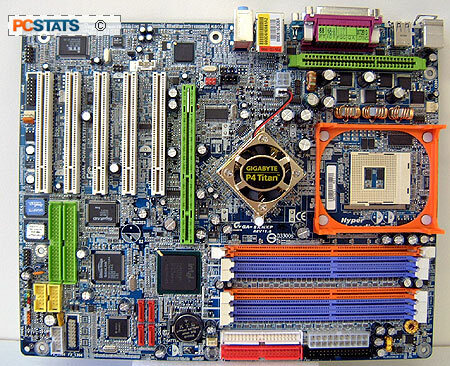 Today we're going to be testing Gigabyte's flagship Intel motherboard, the GA-8KNXP. The GA-8KNXP is based on the i875P chipset and the board has native support for Serial ATA/Serial ATA RAID, Ultra/133 RAID, IEEE 1394, CSA Intel Gigabit LAN, and 5.1 audio. 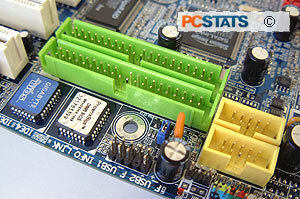 For extra measure, Gigabyte use dual BIOS' on all their boards, and to improve reliability have even engineered something called DPS2 (Dual Power System) which clips into the board in a special slot adjacent to the IO panel. In terms of peripheral expansion, the Gigabyte 8KNXP features an 8x AGP Pro slot as well as five PCI's. The six DIMM slots can accommodate up to 4GB of ECC/Non-ECC PC2100/2700/3200 DDR RAM, however you can only use eight banks of memory. Each side of DIMM counts as one bank, so plan your memory early lest you be caught with six double sided DIMMs of which only four will be used. The inclusion of Norton Internet Security 20003 (Norton Anti-Virus, Norton Personal Firewall, Norton Privacy Control, Norton SPAM Alert and Norton Parental Control) is just pure icing on the cake.